I bought my marinated chicken at Fresh and Easy, but you can also find it at Trader Joe’s. With the pre-marinated chicken thighs it was super easy: Just throw them on the grill for about 15 minutes (to an internal temperature of 165.) The rest of the ingredients are pretty straight forward as well, chips, cheese and nacho toppings of your choice. 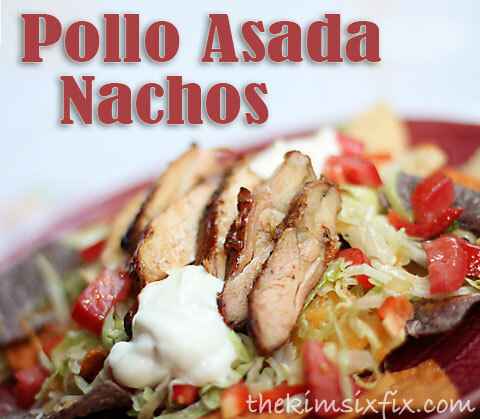 This fresh and quick take on carne asada using chicken and served over nachos features the fantastic flavors of Mexico without the work. Would be a great appetizer or main dish.